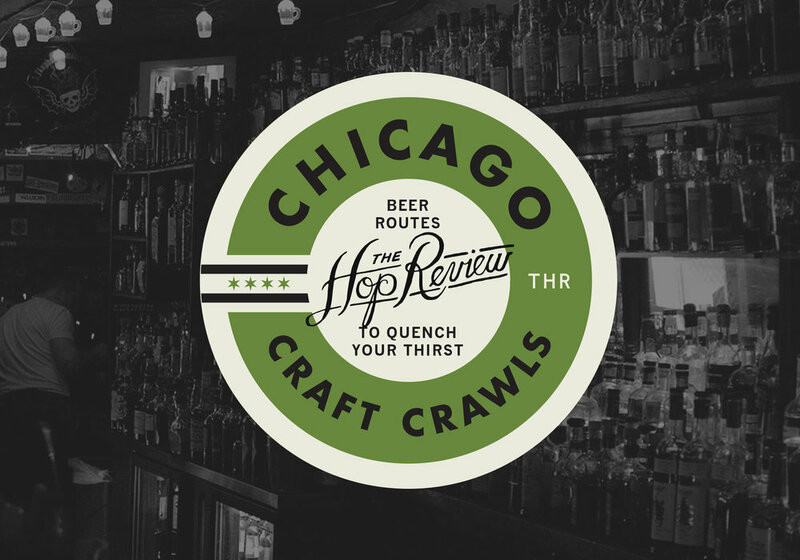 The Hop Review is back with our third Chicago Craft Crawl! As you'll remember from our first and second crawls, we use only the trains and buses of the CTA to reach some of the city's best beer spots, all while exploring the neighbourhoods that make Chicago great. Check out the first two editions for our rules but it's all pretty simple. Don't take any cabs, drink some great beer, and have some fun checking our city! We're pretty ambitious folk but exploring the nearly twenty mile Blue Line in an afternoon is not advisable. With that in mind, we decided to focus on the O'Hare branch, specifically between Jefferson Park and the Loop. If you're visiting Chicago or have an extended layover at O'Hare, consider this trip as an excellent way to introduce yourself to the Chi beer scene and breakup that long ride from the airport. This was the first time we had made it to Fischman's which has long been considered a premier craft beer spot. Upon arrival, the tavern looks pretty typical, with a large rectangular bar in the middle and not much else. The "Liquors" part of the name comes from the adjoined store, which houses an excellent selection of Chicago, American and import beers. If you're in the area, the store itself is worth a visit. The beer on offer at Fischman's was, needless to say, excellent. The four of us in attendance were each able to try a beer that we had never had and everyone agreed the atmosphere was relaxed and comfortable. The lone bartender was knowledgeable and happy to let us sample some of their rare offerings. Our one disappointment? We arrived around lunch and were expecting the famous Wagyu Wagon, a food truck that serves burgers outside the bar every weekend. Unfortunately, despite what their website said, the truck never arrived that day. If you'd like to eat while you're there, be sure to call ahead! An overall great time at Fischman's but time was of the essence so we hopped back on the Blue Line and headed south. CCC Note: While it was closed during our trip, we've heard great things about Irving Park's Independence Tap. If you've made it there, let us know your thoughts! 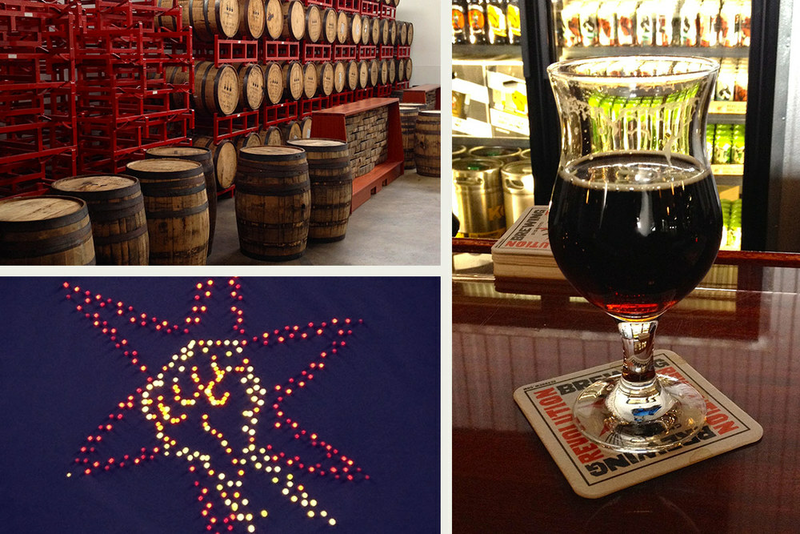 The next stop on our tour, Revolution Brewing, is a Chicago beer drinker's staple. If you have yet to pay a visit to their newest location, the brewery and tap room on Kedzie, move this to the top of your list. First time visitors are usually in awe of the sheer size of the tap room which if often used as an event space. A large bar in the corner, a giant flag, and racks of barrels aging their Eugene variants are somehow overshadowed by the enormous windows showcasing their beautiful production brewery. The beer list is extensive with all of the Revolution brews you'd expect and a few other special treats available only on site such as the previously mentioned and always outstanding Eugene variants. As our Wagyu burger plan had gone up in smoke, we appreciated the BYO food policy and ordered pizza delivered. The laid back atmosphere, complete with shuffleboard table, make for a perfect spot to spend an afternoon. However, we had places to be, so it was back to the train. CCC Note: If the Revolution Tap Room isn't your style, consider stopping at the nearby California Blue Line stop, home of the original Revolution Brewery. You'll find all their beer along with a full menu of excellent food. A long established Logan Square destination, Rocking Horse is a solid spot to stop, grab a bite to eat and grab a beer from their impressive list. We enjoyed our time here but, if we're being honest, this is the first place we'd drop from this Craft Crawl if on a time crunch. We'd heard great things about Rocking Horse before our visit but the Sunday afternoon crowd seemed to be lacking atmosphere found in other places. In addition to this, the service was slow and uninterested in comparison. Logan Square is home to several other well known beer spots (Longman & Eagle, Small Bar) and we'll be subbing one of those in during our next trip down the Blue Line. By far our biggest surprise of the trip, Wicker Park's Links Taproom was recommended to us though none of us had been there. The bar itself is relatively upscale with dim lighting and a good atmosphere. The real star of the show, however, is the beer menu itself. Forgoing the usual Sportscenter reruns, the TV's behind the bar detail each tap's name, style and a short description. In a unique twist, they also show the remaining beer in each keg so you can decide whether that hard to find brew should be your first stop. In an area saturated with bar options, Links is a refreshing twist on an old concept. Our only worry is that it will get overrun by the late night crowds though we would highly recommend it for your daytime Craft Crawl. CCC Note: You'll notice that we skipped over Chicago staple Piece Brewery, in the interest of trying new spots. If you haven't been there yet, this should absolutely be on your list. Check out our chat with headbrewer Jonathan Cutler! By this point on our crawl, it was time to eat again so we hopped back on the L for the short ride to Division Street's Bangers & Lace. The gastropub offers 32 rotating taps along with some excellent, though pricey, food. We settled on a few snacks and checked out the beer menu which is diverse enough to satisfy anyone in your group looking for something unusual. Bangers & Lace is a solid choice if you have the time to make a second Wicker Park stop. However, don't expect to walk in during prime hours as the trendy bar is guaranteed to be packed. Matchbox is by far the smallest bar we've been to in Chicago and only NYC's Proletariat rivals it when it comes to cramped craft quarters. The room is almost entirely taken up by the bar itself and is so small, that the person sitting on the far end must move their seat for people to reach the bathroom. What Matchbox lacks in size, however, it makes up for in endless charm and a small but solid beer list. This was our final stop on the Blue Line Craft Crawl and made for a perfect ending to a long day. Matchbox sums up perfectly what our Craft Crawl is all about. Traversing this great city with a group of friends while drinking great beer in an area you wouldn't normally venture to. There are undoubtedly some solid places we skipped over during our trip so let us know if we missed your local spot. If our list is too short for you, we'd recommend extending your crawl down to the Loop, though be wary of the odd hours Loop bars carry on weekends. A big thank you to the user of Reddit's /r/chicagobeer for the fantastic suggestions. Share your thoughts on our crawl through the comments or on our Facebook and Twitter. Newer PostTHR + SKS: Summer Calls for...Beer Floats.